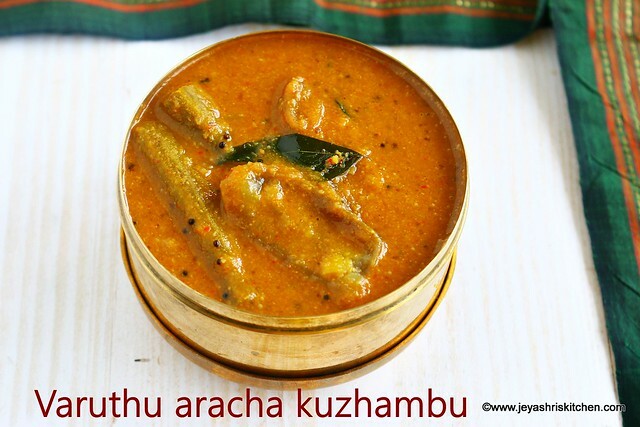 Varuthu aracha kuzhambu| Varutharacha kuzhambu as we call, is a sambar like gravy but made using fresh ground spices and traditionally toor dal will not be added, as we add in sambar. Kuzhambu and sambar are different, for kuzhambu generally no cooked dal is added. When my amma visited me in September, she was telling me that my Athai makes a sambar without toor dal and without sambar podi too. I was surprised and asked my mom the recipe for that. Amma couldn't recall the exact way athai makes. I messaged my cousin later and insisted that i want a voice note from Athai for this recipe. Within a week i got the message from my cousin with the recipe of Varuthu aracha kuzhambu in my athai's voice. At this age of 80, i really admire the way they remember everything and able to recall it the moment we ask for that. These traditional heirloom recipes are treasures and i am privileged to document the recipes and pass on to all. If you have any traditional recipes in your family, which you learnt from your mom or grand mom or anybody else, you can share with me, if you wish to. 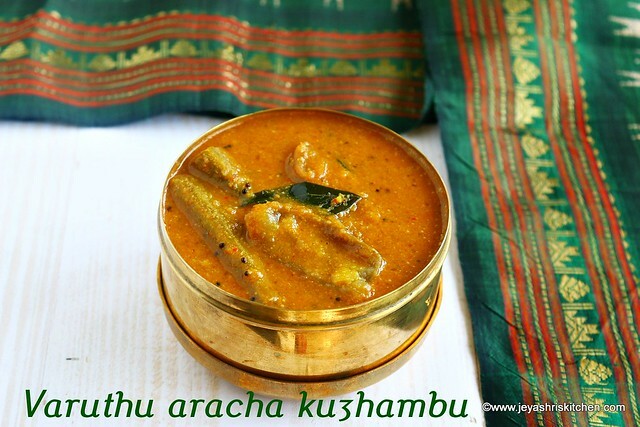 This recipe is not the Kerala Varuthu aracha sambar. * I used drumstick, carrot and brinjal. You can use yellow pumpkin, broad beans(avarakkai)and chow chow too. Cut the veggies and keep it aside. Soak tamarind in hot water and extract 1 and 1/2 cup of tamarind water. If using cooked toor dal, cook that and keep aside. In a pan add the veggies. Add the tamarind water, salt, asafoetida and turmeric powder. Boil this in a low flame till the veggies gets cooked. Meanwhile let's roast the ingredients for the kuzhambu. Roast till it becomes nice golden brown colour. Add the coconut to the same pan and roast till it becomes brown. Do not burn it. Allow this to cool completely and grind this into a fine paste. Use water to grind the mixture. Once the veggies are soft, add this ground paste. If needed slightly dilute this and add. If adding cooked toor dal add it now. You can skip adding toor dal as the ground masala itself thickens the kuzhambu. I added 2 tblsp of cooked toor dal as i had some after making dal for kids. Mix well and let this boil for 2-4 minutes. Stir well. Add water if needed to bring the right consistency. In a pan add sesame oi, mustard seeds and curry leaves. When the mustard seeds splutter, transfer this to the kuzhambu. Mix this just before serving. Varutharacha kuzhambu is ready to serve. We had this with urulai kizhangu kara curry. In a pan add sesame oil, mustard seeds and curry leaves. Rice and toor dal brings the thickness to the gravy, but do not add more than the quantity mentioned. You can add small onions if you want, but traditionally onions are not added in this varuthu aracha sambar. By adding, shallot (Small Onion) with or without the mentioned vegetables mentioned is THE KERALA THEEYAL: I COULD,NT FIND ANY DIFFERENCE BEWEEN THESE TWO?AM I RIGHT ? We add toor dal and rice in this but for theeyal we don't add. Grinding onion in theeyal completely changes the flavour of the theeyal.The similarity is browning the coconut and grinding along with red chili and dhaniya seeds. WHAT MY PAATTI TOLD ME IS " fry the grated cocoanut till brownish ie it looks like "veppam poo"
Yes it has to be fried nicely without any traces of white colour. Loved the 'vellaye theriyapdaadhu' comment!!! Delicious!